The Interfaith Network is a group of diverse cultural and religious faiths, working in partnership with the City of Greater Dandenong council to promote peace and harmony within the municipality. The Network is the first established Interfaith Network in Australia, and consists of various traditional and multi-faith groups who meet monthly at the Council offices. Their goal is simple - promoting understanding, respect and tolerance for each other's beliefs by living together in peace and goodwill. 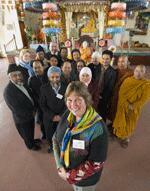 The Interfaith Network covers faith communities in the Springvale, Dandenong, Keysborough and Noble Park areas. The Network strives to achieve the vision of 'Many Faiths, One People'. Would you like an opportunity to visit local places of worship, including an opportunity to be welcomed by a member/leader of each faith and to learn something of their belief, practices and community here in Australia? The Network consists of leaders of the Baha’i, Buddhist, Christian, Hindu, Islamic, Jewish and Sikh faiths and their communities. The spiritual organisations of the Sathya Sai and the Brahma Kumaris are also members.